The name "Tirta Gangga" reminds about a sacred river in India, the river Gangga, yet Tirta Gangga is not a river, it is a spring wate4r in the midst of dry and barren land of Kabupaten Karangasem, east Bali. The location of Tirta Gangga is around 10 km north of Amlapura city, 95 km from Denpasar city, 110 km from Kuta, 128 km from Nusa Dua. The administration of Kabupaten Karangasem includes all tip of eat Bali island which is known for its dry and barren land due to lack of water source, and full of hill with the highest peak of mountain in Bali that is mount Agung, a 3142 meters above sea level. The hilly region of Kabupaten Karangasem is favorable for some kind of plant such as salak known as snake fruit and the lontar palm tree, pandanus, and eucalyptus tree, beside which makes a beautiful panorama on the surrounding of the villages, towns and farming areas such as Putung Hill, Bukit Jambul, and Iseh rice terraces. While on the eastern tip of the island is totally barren, stony area and totally lack of water. Today with the opening of the road along the beach of south east Bali leading from Denpasar to Klukung city, makes the coverage of the area far much shorter, which is around 1 hour shorter. Starting at the turn of 19th century Karangasem was one of the 8 small kingdoms of Bali which extended its influence up to the island of Lombok and Sumbawa. The weakening of Bali kingdom under Gelgel rule was the main reason of those kingdoms such as freeing themselves from the control of the main kingdom. The situation had actually started from the year of 1651. Each of those 8 kingdoms extended their influence and control over each other. In 1677 the kingdom of Karangasem succeeded inserted control on Lombok and Sumbawa. The king is known as one of the princes that was so inspired by garden with bathing place. 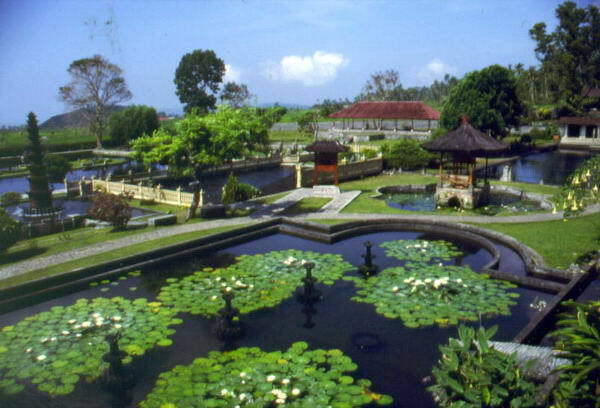 In Bali he built Tirta Gangga and Taman Ujung, and in Lombok he built Taman Narmada. Tirta Gangga is the sacred name of water which for Balinese is only used to refer the water in relation to religious ritual. Beside the word "tirta" there are words " toya" and "yeh". Toya is used to refer the water among royal family and the religious functionaries family, and yeh is for common people. The respect of the people to the spring water by referring it as "tirta" due to the fact that it is the only big water spring in the scarcity of water. Local people uses the for drinking, religious rituals, and source for other daily life. 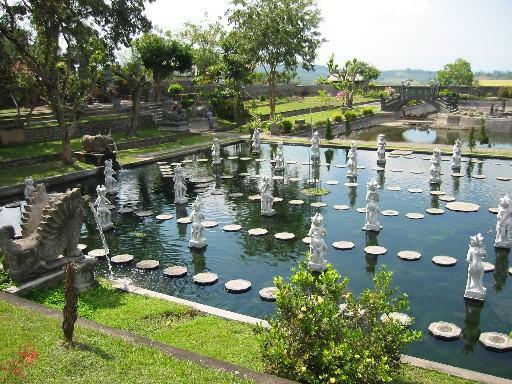 It is mentioned that Tirta Gangga got extension with more beautiful garden in 1948, where a swimming pool was also added, and the public can enjoy bathing at the swimming pool. During 1990s the place suffering the same case such as other major tourists objects in Bali. Bungalows, art shops and other business oriented activities appeared around the object. This was the result of the use of Tirta Gangga as one of the main stop for tour organization to east Bali, besides Gowa Lawah, Besakih Temple, Candidasa, Taman Ujung, Tenganan Pegringsingan, Putiung Hill and especially the growing popularity of Tulamben and Amed beaches. A tour itinerary known as Bali round trip spending one night in east Bali, either in Candidasa or Tulamben always includes the visit to Tirta Gangga on the way to North Bali. Some visitors already use the bungalows not only for one night overnight stop, but developed a specific activity such as yoga contemplation, or certain activities relating to self healing program. This is supported by the situation of the environment which is quiet and far from the towns and any business life.